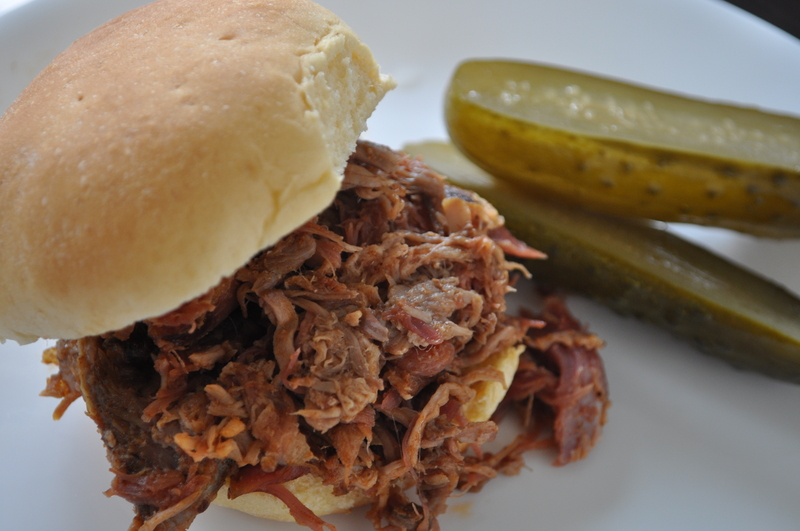 I’ve tried a lot of pulled pork recipes in my time, and this is by far my favorite. It’s North Carolina style barbecue, so it’s a vinegar based sauce, which is there to serve as a compliment to the meat instead of overpowering it. The meat itself is super flavorful after chilling out in the fridge all night with a serious dry rub. It’s combined with smoked ham hocks that give it an awesome depth of flavor. Plus, it’s super easy and cooks all day in your slow cooker. I served it with corn, kale chips, and blackberry cobbler. If you are still searching for that perfect pulled pork recipe, I would definitely give this one a try! Combine 3 T sugar, paprika, chili powder, cumin, 2 tsp salt, and 2 tsp pepper in bowl. Pierce pork with a fork all over, then cover with spice rub. Wrap in plastic wrap and refrigerate overnight. Place ham hocks in slow cooker, position pork on top, and pour broth over. Cook for 9-10 hours on low, or 5-6 hours on high, until pork is tender. Transfer pork & hocks to a bowl and, using forks, shred into bite-size pieces (it will further break-up when mixed with sauce). Discard any bones, skin, or excess fat. After letting braising liquid settle for 5 minutes, skim off fat using a spoon. Strain liquid into a saucepan and simmer for 20-30 minutes. Whisk in vinegar, ketchup, and remaining 3 T of sugar, and bring back to a simmer. Season with S&P to taste (note it will taste very vinegary on its own). Toss pork with 1-2 cups sauce, adding enough to keep meat moist. Serve on buns with additional sauce. Posted in Recipes, Slow Cooker and tagged barbecue, dinner, pulled pork, slow cooker. Bookmark the permalink. looks good! wished i had a slow cooker! You should get one! I love mine! Yum! This one looks so good. I love the vinegar based barbecue. I want to try this one! Thanks! I loved this one!